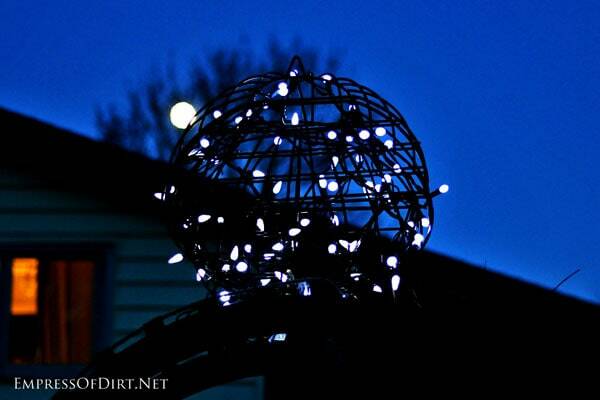 Repurposed Garden Art Idea What is that giant ball of light in the garden? 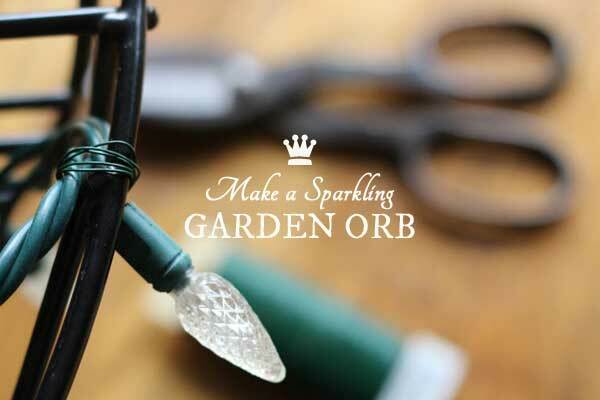 It’s my free version of a lighted grapevine ball. I also have instructions for making decorative garden balls here: DIY Decorative Garden Ball Tutorial. 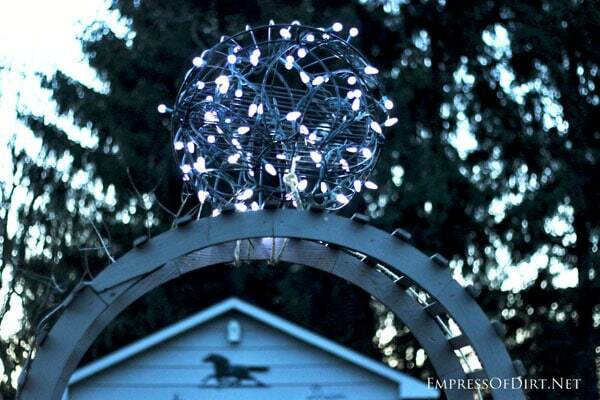 You’ve probably seen various orbs made from grapevines, chicken wire, or metal wire covered in outdoor holiday lights. After seeing the high price tags, I decided to make one using stuff I already own. I always suggest “shopping” at home first, especially if you have any sturdy garden items in winter storage. If they can withstand the cold season, they’re fair game for winter garden art. Here I used metal wall planters. 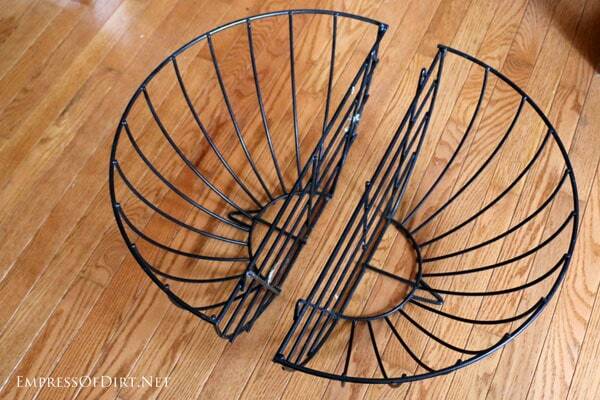 (4) Metal wall planters (the “half circle” type—see the photo below). Each one is 1/4 of a sphere. Attach four together and —tada! —you’ve got a nice, big metal sphere. Outdoor holiday lights. You’ll need 1-2 sets for each half of the sphere. The more the merrier. 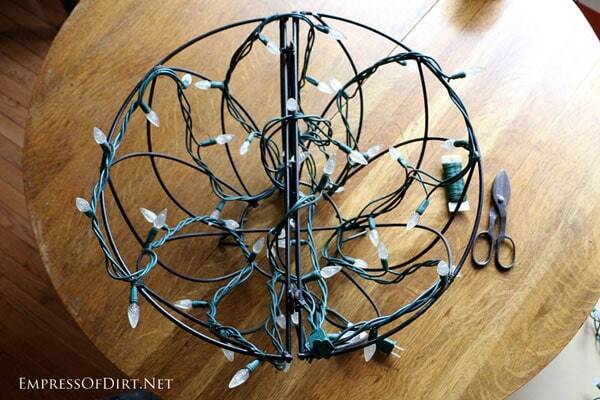 I used (2) 12-foot strings of lights. 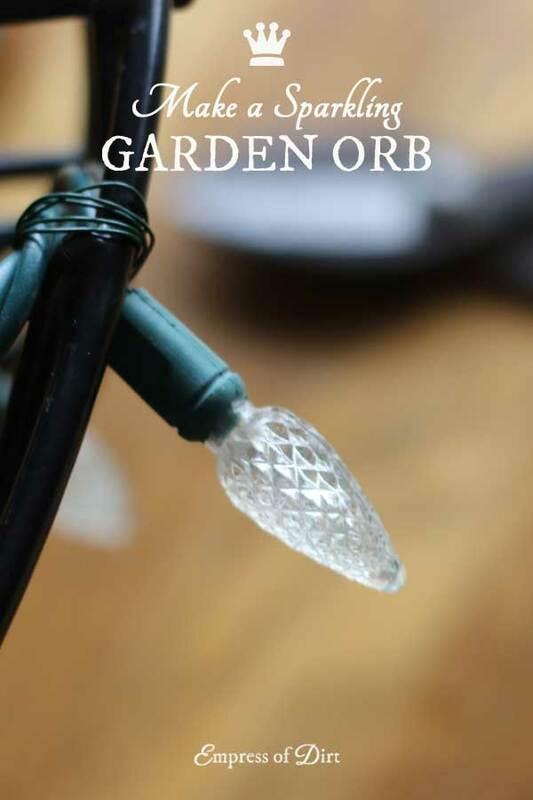 Outdoor electrical extension cord (make sure it’s winter-safe and long enough to reach from the power source to the orb). Place two planters back to back and attach them together. Repeat with the other two planters. You won’t want to join everything together (to form a sphere) until the lights have been attached and tested. 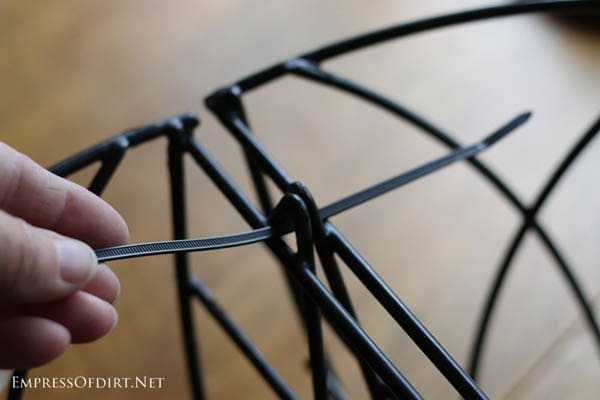 I used cable ties to attach them together but you could also use small pieces of wire or some black duct tape. 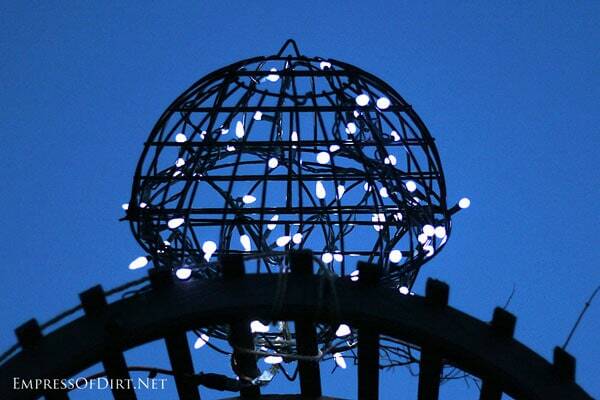 Decide whether you want the lights on the inside or outside of the orb. I put mine on the inside. Be sure the light plug (that connects to the electrical extension cord) is in a convenient location. I placed mine at the bottom of the orb. 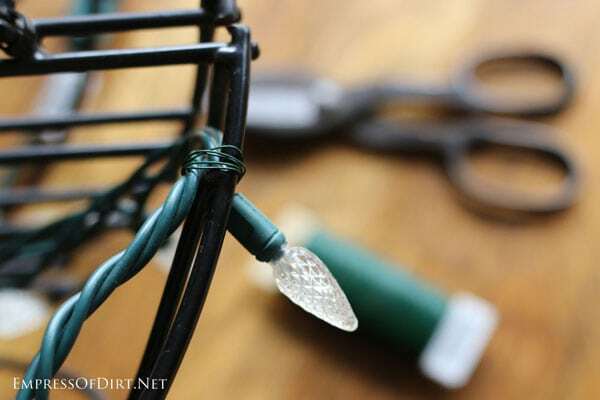 Be sure to test all your lights BEFORE ASSEMBLY to make sure they work when connected together. 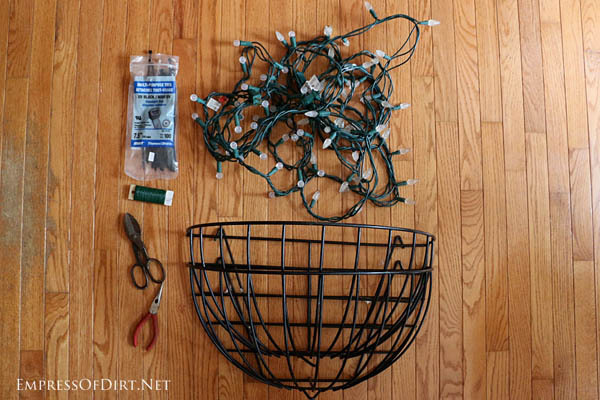 I attached my lights following the shape of the container, going up and down, working my way around. When both sets of containers have lights attached, join them together to form a sphere. 4. Hang It Up, Pup! My original plan was to hang it from the giant walnut tree but my electrical cord was not long enough. 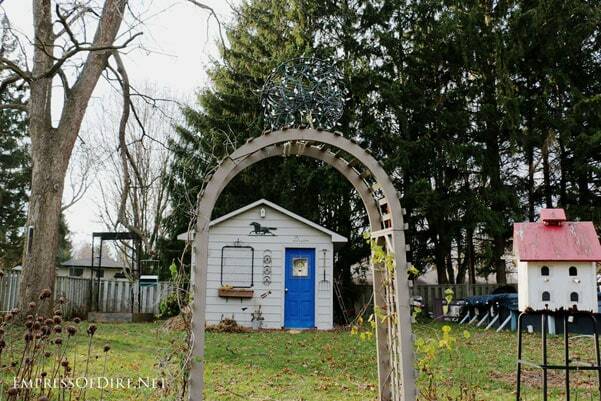 So, I went with Plan B: Placing it on top of the arbour. It’s secured in place with some thick twine. It’s fairly invisible in the day time. Here it is as the sun is starting to go down. Just as I was taking the last photo the moon came up over the rooftops. Now I have two beautiful orbs of light. Hello Nancy – and thanks!